Up again at early dawn on Sunday March 21, the first day of spring, I quickly took care of the musical chairs I play each morning dealing with a vehicle so packed full of gear that much of it has to be repositioned between day and night. My body was feeling fine after a recovery day without any lingering effects from the strenuous Saturday effort. Driving north on SR190, I played out scenarios of how I would repeat my Black Mountain hike by starting at dawn making for a much less strenuous effort. I really wanted to go back up there because on that very rushed afternoon, there were many strong subjects I just walked right by and much more I had not had time to explore. And wondered how I might fit it in with the other 3 planned hikes? 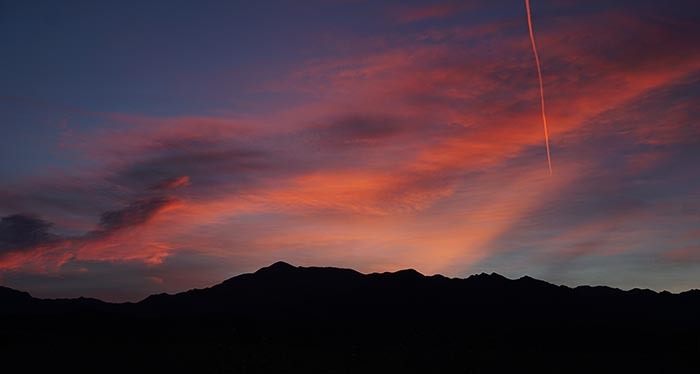 A few miles north of Furnace Creek I parked roadside to snap an "I was there" shot below of the dawn sky as a jet contrail made a bright red vertical streak in my frame. Turning onto the Scotty's Castle Road, a big sign related that road was closed at the junction east but open to Ubehebe Crater. As I passed the northern end of Mesquite Flats, murky sun began shining on the northern Panamint Range. 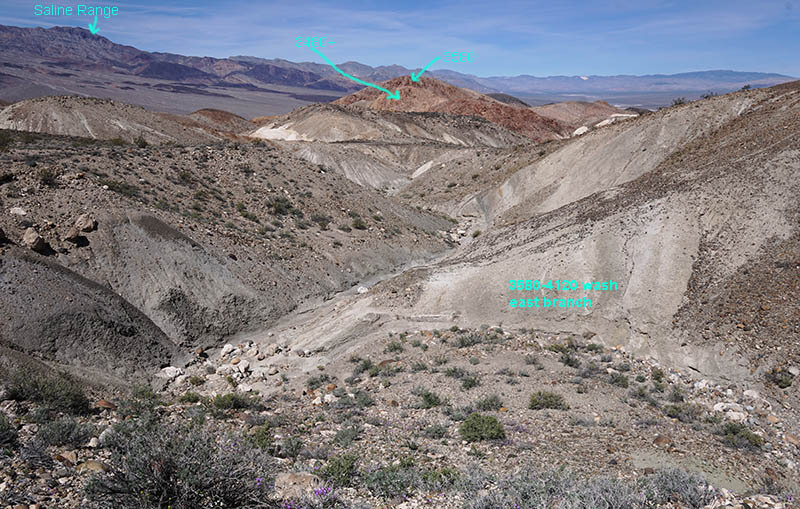 Beyond the huge alluvial fans spreading out from the Northern Grapevine Mountains, began wondering about which of two possible planned adventures I would choose? One of the hikes was just south of Ubehebe Crater along the Racetrack Valley Road and it didn't take long for me to reject that notion as the other hike just on the basis of geological maps held much more photographic potential even though my eyes had never seen it nor were there any images by others of the canyon. Well I'd think about that a bit but first wanted to take a look at the crater so drove up and around the crater loop noting the crater indeed was as spectacular as I'd seen in images, especially the east rim erosion steeps so I would need to fit that in during one of the remaining day's afternoons. It was sunny but with quite a bit of thin high clouds, temperature mid morning upper 60s, and a minor intermittent breeze. I drove back around and off towards my goal for this day and after some looking found a decent spot to park roadside. Parked, a lot of gear went into my pack as this was going to be a long effort though route finding was not a concern. In addition to two quart water bottles, I added a 15 ounce bottle of ginger ale. At 8:14am started a track on my Trimble Navigator screen then was off on my route quickly rambling up and up on an open rocky brushy bajada landscape that included some up and downs crossing minor washes. Not far along had to negotiate a wide deep wash arroyo that had only one spot on each side to climb up and down at. From there was a half mile of awkward ups and downs across side washes traversing angled slopes. Finally after an hour arrived at the mouth of a canyon I would be within the rest of the day. Immediately was seeing quite a lot more wildflowers and species that were all large robust plants indicating indeed as I expected this was a special canyon for vegetation because of both geology and more precipitation due to its topography. And as I continued up the wide wash of the canyon, areas of Bigelow's monkeyflowers, gravelghost, notch-leaf phacelia, golden evening-primrose, and mohavea flowers colored the wash gravels in significantly more density than I'd seen in Hole-in-the-Wall wash. Sandy areas of the wash showed a lot of deer hoof prints. Another indication the canyon had enough vegetation to support such animals even during drought years. And note there were permanent springs in the zone though not on my particular route. I would see no human foot prints this day nor cairns. 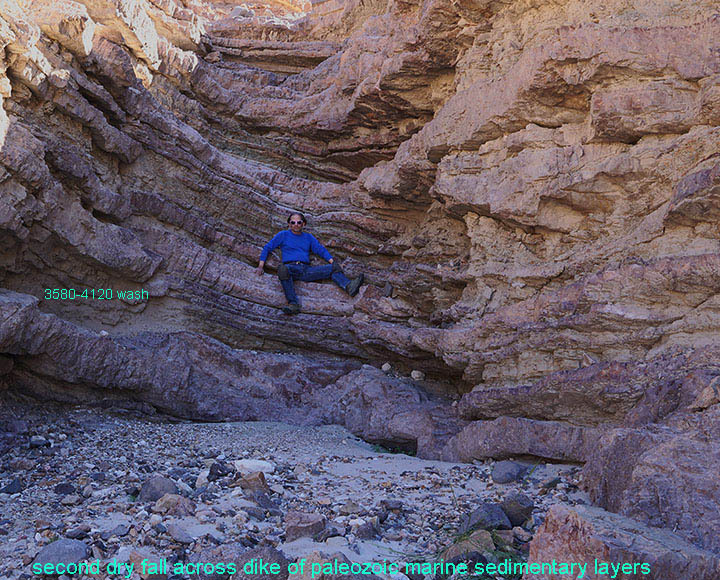 An hour later I entered the mouth of my target side canyon of hydrothermally altered volcanic ash clay deposits and was impressed by densities of large showy gilia on the sides of the wash channels per image above thus named it herein, Gilia Canyon. Skies were now much more cloudy indicating the approaching weather system overrunning resident high pressure. Colorful flowers though not dense were scattered all about the canyon slopes. Gilia Canyon is divided into 3 basins with each basin separated by sections of narrow winding rock lined washes with nice shaded sandy wash bottoms ideal to camp at. 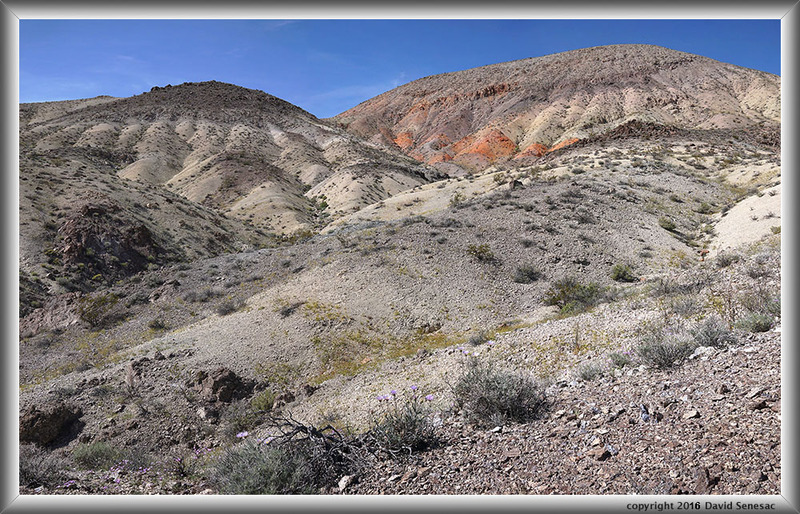 After snaking through the lower section wash I entered the middle basin that opened up into an array of rainbow clay formations that would be a park icon were it not remote and unknown miles from paved roads. My second subject in the basin is the image PF05186-05208-3x1v at page top. Unfortunately the nature of many of these badlands wildflower and rock subjects is significantly more adversely aesthetically affected by image downsizing than most large format landscapes because much of the beauty is in small elements within a contrasty matrix that become a mottled blur. About the time I worked that subject, breezes seemed to pick up causing increasing waits for the infrequent lulls so my foregrounds could focus stack blend. And that also caused me to abandon using my 60mm lens that would have resulted in much larger images but would have required 4 times as many frames, taking a lot more time waiting for lulls. Thus I began to consider the notion I would need to return on a nice sunny calmer day later in my week. And though I really liked my Saturday Black Mountain destination that I also wanted to return to, this was better and less difficult to reach. Many more interesting and colorful plant species here as though I'd found one of the crown jewels of the park. But again so much to do and so little time. 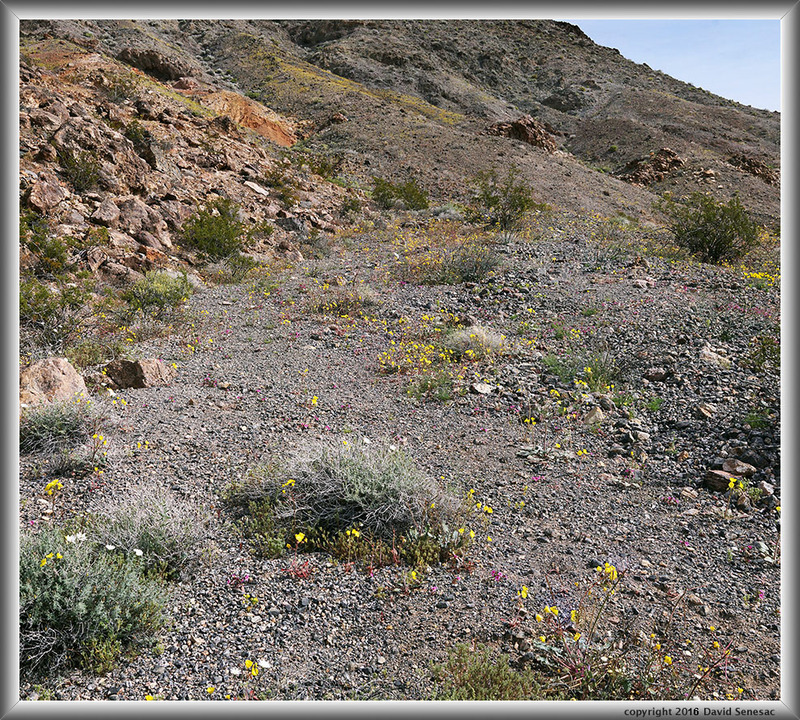 This next image above shows how denser groups of bushy perennials and annuals colonize the benches just above washes and on the wash borders one often sees a line of creosotebush, larrea tridentata. Most of the white sunflowers are white tackstem, calycoseris wrightii. Anchoring my bottom frame edge at center is a bright yellow hued golden evening-primrose, camissonia brevipes. In some canyons like Furnace Creek canyon I worked on Friday and Saturday they were much more numerous but here were noticeable more species. The enlarged vertical slice view right slice shows numbers of yellow hued desert goldpoppy, eschscolzia glyptosperma. 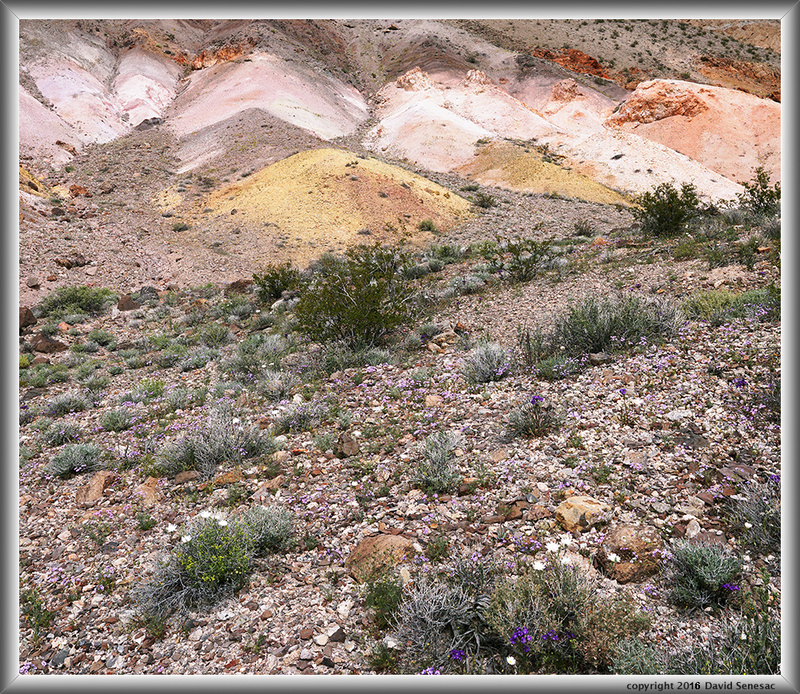 The image above is in the upper basin of Gilia Canyon showing wildflowers below pink, white, orange, and ochre hued clays. Lushest areas of wildflowers were near a saddle and ridge line into another major wash canyon. But by time I reached that area, breezes had become too difficult to shoot serious images. The next canyon that I've named Gray-Blue Canyon due to considerable grayish blue volcanic ash clay deposits. One section had some intensely orange hued deposits ala Bryce Canyon. The above image shows the "orange cat's head". Notice the eyes, nose, mouth, and ears? And there is a commanding hoodoo riding on its neck with an orange head wearing a gray suit. A lot more work for me there during some future Death Valley spring they receive goods rains. But yeah I did climb down into that ravine and a quarter mile further. Something for an old man to look forward to some future year. Obviously the zone is a fantastic place to backpack into late winter that given the need to carry water in would require a team of maybe 4 people. Two just lugging the heavy water that weighs 8.34 pounds per gallon or about 133 ounces, enough for one person for one day if not hot and overly exerting. Two strong people, non-photographers, carrying minimal backpacking gear otherwise could carry in 3 gallons each while the photographers carried in one gallon each. My carrying weight would be about 60 pounds while those lugging water about 50 pounds. The total of 8 gallons could last the 4 people for two full days and one night with the team exiting near sunset the second day. 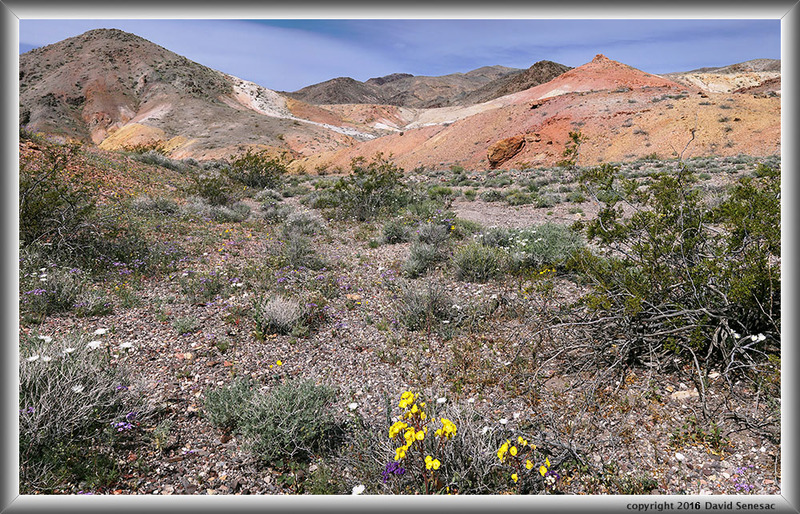 On my way out shot the above dense golden desert snapdragon, mohevea brevilflora, and Bigelow's monkeyflower, mimulus bigelovii, on a small wind protected gravel flat at the foot of a small side wash of Gilia Canyon. After that with winds starting to blow as the delayed big cold trough pushed in, I rambled quickly out of the canyon the few miles back to my parked vehicle that ended up being an over 10 mile effort with about 1000 feet of vertical. Yes I was indeed rather weary at the end. On that slog out decided I would drive the several dozen miles out of the park to Beatty, Nevada a small town where there was lodging with Internet access so I could take a good look at weather information to make best use out of my remaining road trip days. And then the next windy day that would be useless for photography, would drive 75 miles south to Pahrump, Nevada where I could re-supply food and drink at supermarkets before driving back into the park via SR190. That Monday evening was in a modest motel with Internet access. Had a nice warm shower, Subway footlong pepperoni cheese melt sandwich, dealt with gear and laundry, then thoroughly checked weather information on the web. A cold northern wind began blowing trees and whatnot outdoors making rattling noises. Tuesday morning March 22 winds were still blowing and temperatures were chilly, a significant change from the above normal hot temperatures hours before. I drove south a couple hours watching clouds of dust rise for miles in sandy areas, reaching Pahrump, an unincorporated exurb urban area of 36,000 without real industry but fueled by real estate expansion from Las Vegas an hour by highway away and associated usual growth industries. Oh there are token casinos hotels and brothels plus many of the corporate retail, restaurants, service, and governement employment everywhere in growing urban areas today. Well I visited supermarkets, read a book I'd brought along just for this kind of wait out the weather circumstance spending a few hours parked in shade at a park. Even mid day was unpleasant outside despite being sunny. Mid afternoon I left and drove west on SR190 back into the national park. Crossing the summit of the Funeral Range were good areas of wildflowers especially golden evening-primrose though this day shaking violently in the gusts. 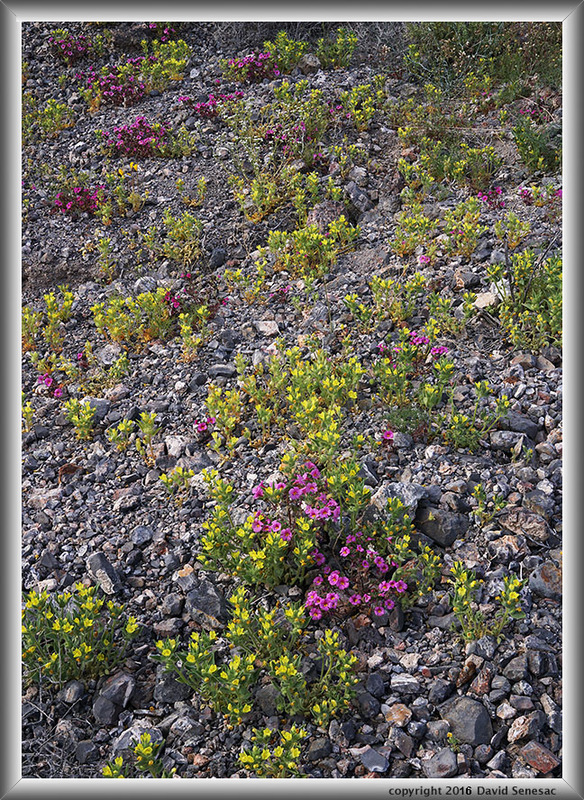 Generally the wildflower areas appeared somewhat past peak with a mix of gone to seed plants along with rising plants. I continued on west and drove up into a familiar spot on the Hole-in-the-Wall road where I had an easy end of day as the wind even down in the deep wash was enough to blow around my cooking gear outside. With all the time to plan the rest of the week, I decided I would hike the canyon south of Ubehebe Crater Wednesday while forecasts showed still breezy conditions then Thursday a return to my Monday's destination, and Friday possibly a return to the Black Mountain destination. Thus Wednesday morning March 23 rose again at dawn and drove north on Scotty's Castle Road first stopping at the Mesquite Springs Campground that I was surprised to see full of car campers. They were refugees from the otherwise full campgrounds at the park during this Superbloom period. And yes there was a spring with running water amid cottonwood trees. On to Ubehebe Crater, I parked just before the loop road, started a Trimble Navigator track then hiked north a half mile to a small ridge where I wanted to check views. That turned out to be uninteresting and within 45 minutes was back at my car having covered 1.36 miles. I drove south on the Racetrack Valley dirt road about 2 miles to what looked like the canyon mouth for my adventure about a half mile east. Where a wash crossed the dirt road at 2660 feet was an obvious location to park at. There were signs many others had camped there since it was the first decent location to do so along that dirt road at a legal minimum distance from the paved road. This online topo link map link center crosshairs identify the wash I will name the 3580-4120 Wash herein while the Racetrack Valley Road is the dashed line a mile west. By moving the map north a bit one will see Ubehebe Crater. 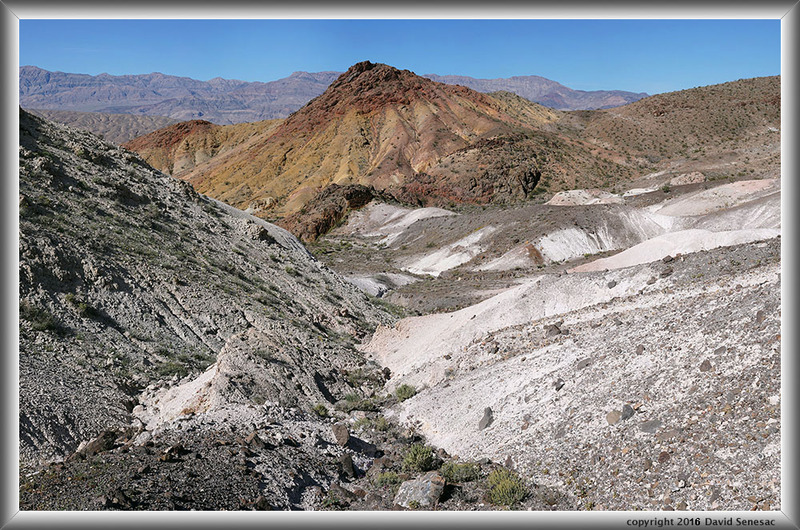 For miles between Ubehebe Crater and The Racetrack, there are numbers of side canyons on both the east and west sides of the Cottonwood Mountains and the east side of the Saline Range most of which have probably not seen visitors for years. With tall Tin Mountain to the south, began walking southeastward up the shallow alluvial fan about 10am under sunny skies with a minor breeze about. It was in fact less breezy than I expected and with hindsight had me second guessing my choice this day as I might have instead gone back to Gilia Canyon? Entering the mouth of the canyon at about 0.4 miles up about 80 feet, I left the brushy fan behind and immediately encountered areas with volcanic ash altered clay deposits plus many basalt boulders. There were some foot prints in sandy areas but those soon became just a single boot print. It was likely some that had camped where I parked would have explored up to the canyon mouth however from the road one cannot see anything particularly interesting on the mountain. 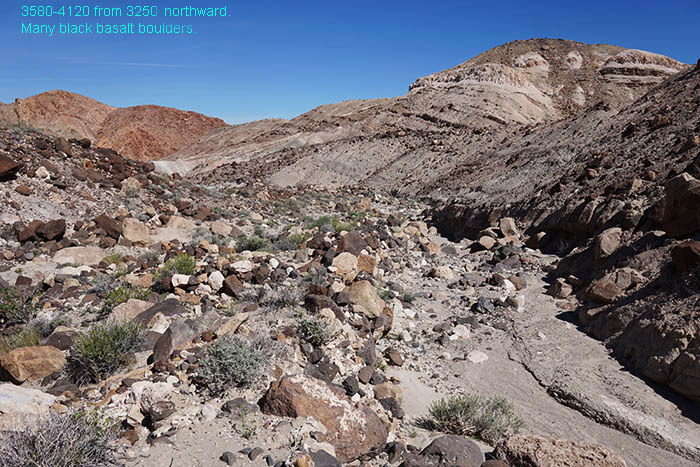 The canyon deepens quickly turning southward and a third of a mile further is a split at 2860 with the water course on the map shown going east. However my route without a blue water course continued south as the map shows steeper areas on the other canyon I feared would have more difficult dry falls. And for you armchair folks reading this, most such blue lines on desert region topographic maps are in fact bone dry except for uncommon periods just after significant rain that are usually summer thunderstorms. And in the desert rare places that actually have flowing water are sure to be marked on a map as a spring. After 0.2 miles the wash then turns southeast and immediately the first impediment to hiking up this canyon is encountered at 2960 feet or 300 feet above my parked car shown in the above image, a big round basalt chockstone boulder. I identified the spot in TN with a mark waypoint. At that point one has climbed a modest mile and one half from the trailhead. The image shows a shady drop of about 9 feet in a section of the topo that is low gradient. A good example of how within map 40 foot vertical granularity one may encounter abrupt cliffs that may be stoppers. There is a shelf at my waist height that I could stand on. From that position a smaller black basalt rock was also wedged and provided something to grab onto in order to pull oneself up. First I pushed my tripod with A6000 atop and hefty daypack up above. 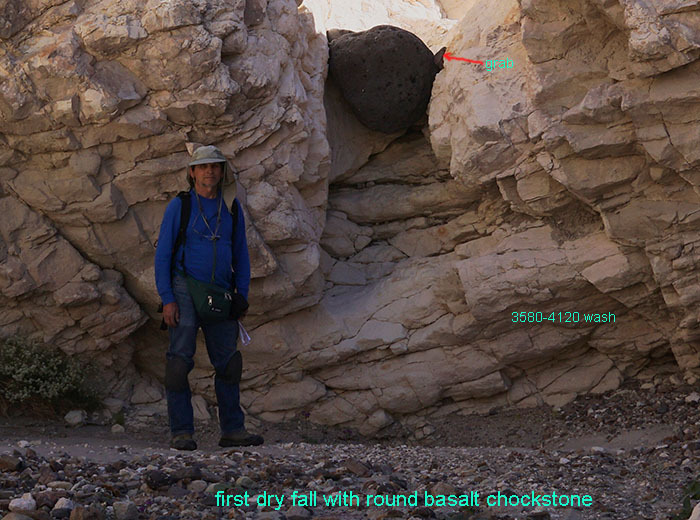 Note although it is not clear in the image, one cannot use the small features below the big round rock for foot placements because they are inward a couple feet below the round boulder. Thus this is more like doing pull-ups to get up. Something thin little me could readily perform but I would expect to block fair numbers of other people. In fact that one boot print went no further. Above that drop in the sunny overexposed area behind one had to hand climb up another 6 feet. I continued on another third of a mile and came to another dry fall across a harder band of Paleozoic sedimentary strata that was a bit more than about 15 feet high. At the bottom was a pleasant grotto with sandy flats that would be shady most of the day and could provide a pleasant camp spot. The stack of terraces steps were readily climbed though I needed to do so carefully as I free climbed while holding onto my tripod/camera while wearing the daypack. Immediately above that climb was its second section that was a plumb drop of about 10 feet where the plunge pool had hollowed out rock below the brink such that though one might step up a bit at the base to be able to reach near the brink, there was nothing between the two but air to grab or provide foot placements. To go straight up would require a lot more arm strength effort than the chockstone hoist. Fortunately that cliff could be bypassed by climbing up and around on my left shown by arrows on the above image that was modestly exposed requiring a bit of hand grabbing at sketchy points. Neither of these spots one would want to fall at especially a solo person like I was. 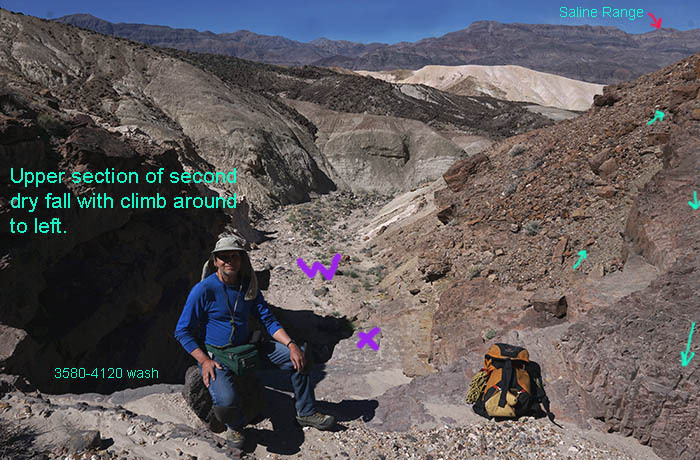 In the image, the level rock area in the sun between me and my pack but a dozen feet lower with a purple X is the top of the first terrace section climb and the purple W is the wash about 30 feet below. Continued up the now quite sunny wash and came to the third and last dry fall of about 10 feet vertical on my way up to my primary target zone that was near just ahead. Well that was again undercut so impossible to directly climb but easily bypassed on the right by climbing up and around on the canyon side slope. At this point I stopped at 11am for a 15 minute break in some shade at 3200 feet or a modest 540 feet above my car and maybe 2 miles distance. Thus was on the route for only an hour so was moving rather rapidly as is often the case while carrying about 25 pounds of gear including a couple quart Nalgene bottles. And I'd been carrying that yellow rope seen strapped to my daypack in image above on trips like this for maybe 2 decades but it somehow managed to escape on this day? It's up there somewhere haha. 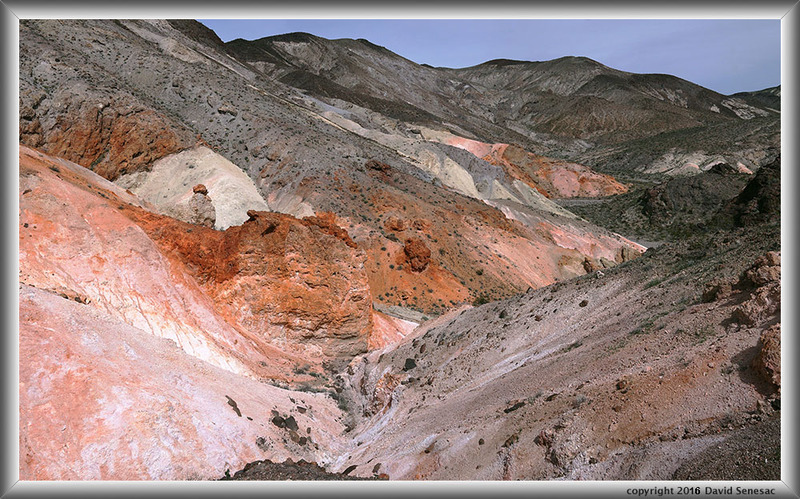 Upon reaching elevation 3230 feet the wash canyon broadened turning south in a zone of much colorful clay formations. Looking up canyon south, I was looking right into the sun in late morning so light was poor for any photos. I needed to climb further up the canyon and point my camera north so on I rambled. Stopped at 3250 for the above image. Continued up before turning around at 3470. I dropped down a bit then rounded the north side of a slope at 3500 feet my high point of the day 810 feet above my vehicle where at 12 noon stopped for what turned out to be a modest set of images of that area one of which is the above. The arrows show my route. The arrow below the red peak at center in the back was where I looped back around later after exploring the ravine east of the rib at right out of this view. The area at skyline upper right is about Little Ubehebe Crater. The wind I had feared was making its appearance so indeed had made the correct decision in not hiking up to Gilia Canyon this day as it was too soon after that strong wind event the day before that had not moved far enough east beyond the Rocky Mountains so was still influencing winds in this Great Basin region. Continuing to traverse east, I dropped at bit then climbed back up to the level top of the ridge due south of topo point 4120 where I could look north down a shallow ravine cutting right through colorful clay strata that is the image above. Note the purple flower at frame bottom center is a showy gilia. That is actually the top of the drainage for the fork I mentioned splitting at 2860 near the canyon mouth. I dropped down into the wash and enjoyed looking at what water erosion did to this soft formation. At a nicely shady spot took a half hour lunch break including a couple Del Monte fruit cups I had come to enjoy during these desert hikes. Some nice subjects I might have stopped to work but at this point the light was a bit harsh right at mid day and winds were blowing. 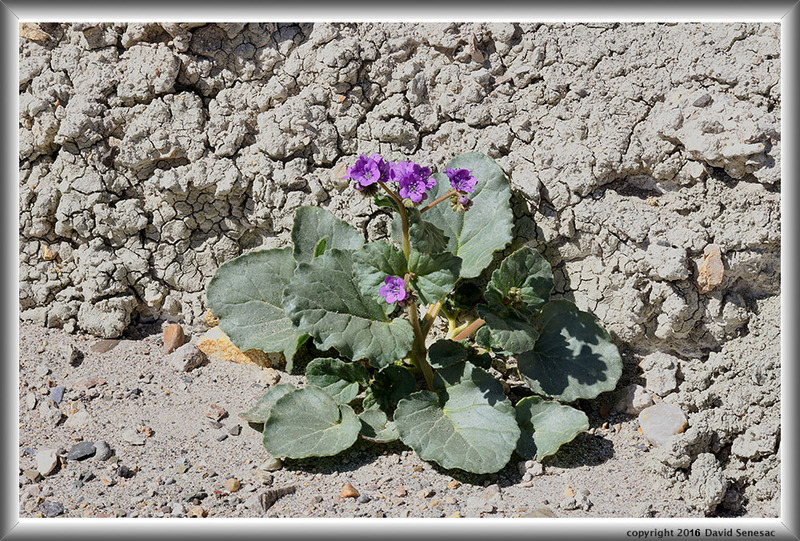 I did shoot the close-up of a caltha-leaf phacelia plant against the side of the clay wash, at image above phacelia calthafolia, that was down about a more protected spot in the ravine. Continuing down the wash, I took a few modest images and at 3190 then turned out of the canyon due south up and over a low saddle that at 2pm brought me back to the 3580-4120 Wash where I had stood 3 hours before. From there I didn't dally much as I rambled quickly downhill past the 3 dry falls rather efficiently and was back at my Forester by 3pm. The TN track showed 6.4 miles total. With the early hike near the crater, 7.7 miles for the day. I drove off north back to the Ubehebe Crater paved road loop. The parking lot was full with people walking all around some hiking the trail around the crater rim others going up to Little Ubehebe Crater. With Scotty's Castle verbotten due to flood damage, the crater and The Racetrack down a long long dusty road were the only icon features at this north end of the park of interest to visitors. Actually there is an abundance of interesting no-name landscapes without trails people could explore given some imagination but like a Death Valley ranger once related to me, most people are scared of the real desert. Thus there are truly vast areas of the park that are virtually devoid of people or their tracks. For me it was too early in the afternoon to take more than a few token informational shots. There was a really strong telephoto shot of the crater rim I really wanted to snag about late afternoon. After tomorrow's long hike would try and drive back up here before the sun set. At that point drove off to spend the remaining few relaxing hours of the day at where I would start my hike up to Gilia Canyon in the morning. One of my chores was to take a bottle shower. In my car was a 64 ounce plastic juice bottle filled with water. Onto that goes a spare plastic lid drilled with little holes so when I pour the water on my body, it comes out like a flower sprinkler more slowly. By time sunset arrived, I'd fully squared away all the gear for Thursday's effort with my pack ready to go as soon as I awoke early dawn. Thus would hike in the chilly dark for about an hour. A chance to play with my powerful 2550 lumen EagleTac MX25L3 flashlight. And after the sun came up would stash that and my North Face fleece jacket along the route then pick them up on the return. After a long pleasant night of sleep inside the Forester was up and stirring about 5am. Sunrise was about 6:45am on this Thursday March 24. Winds had nicely subsided during the evening and the wee hours were relatively quiet. A lot to look forward to this day, I was up and ready to go in about 20 minutes. Started the GPS track on TN and was interested in seeing how useful that would be in the dark. Efficiently traversed across the bajada plain while taking occasional reads on the cell phone screen of where I was at. Without the TN program would have been fine simply using my compass but it was nice to fine tune my direction. A mile along dusk had lightened the sky enough I could dimly see the landscape. Another 15 minutes and could shut down the flashlight. After a mile stopped to stash the gear then continued on. Besides the removed fleece jacket, was wearing a nylon shell and long sleeved cotton t-shirt. As shows in my images above, always am wearing tough Levi 501 jeans below because of all the rough terrain, brush, and rock I navigate through. Although stopping to take some images en route, I reached Gilia Canyon by a bit after 8am. Skies were mostly sunny but with high thin clouds and quite a number of jet contrails that I leave in on the skies of my landscapes per my natural style. There was a variable breeze that would grow and it would slow my work all day though not as strong as the previous day. 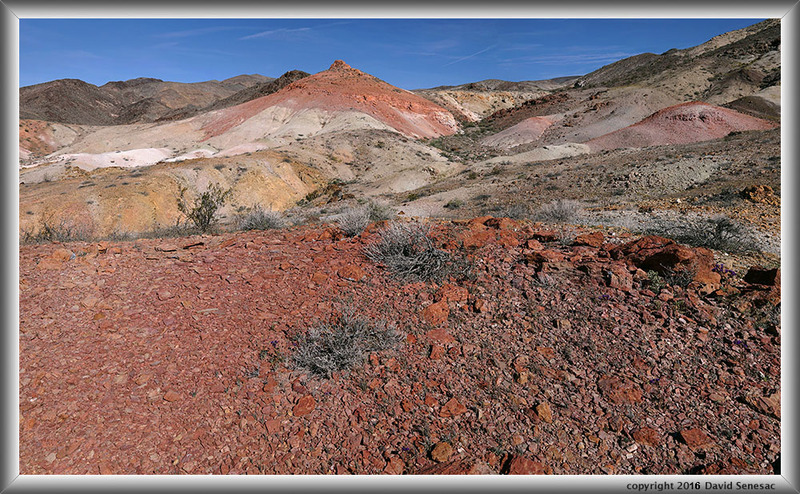 The above image with rusty red rock in the foreground was shot about 9:15am. I then shot four other fine images that are not included in this feature because the images could be used to identify where this location is that at this time I'll choose to keep secret. Well at least until this work is displayed in a public exhibit. 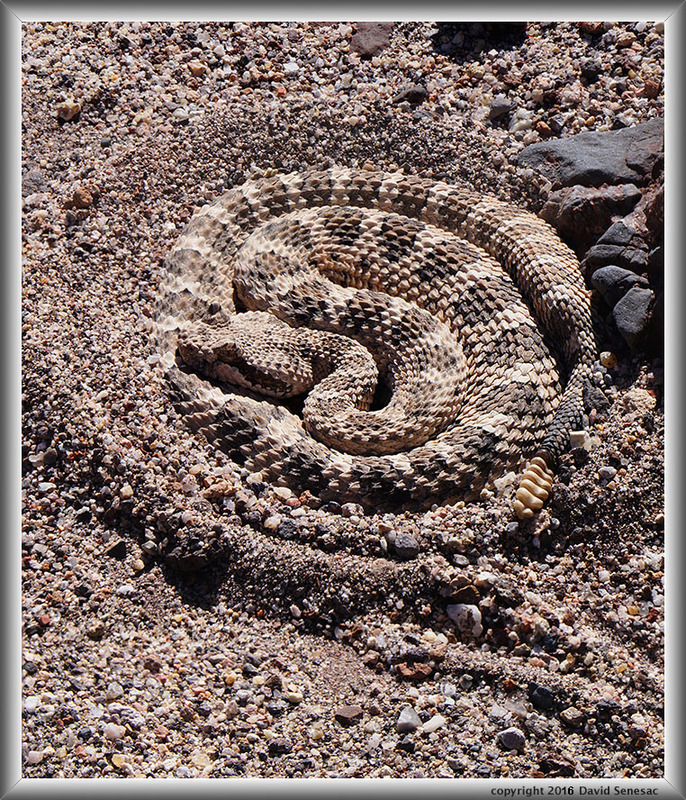 In the upper basin wash came across the above sleeping rattlesnake coiled up cozily in the sand. It made for a nice close-up as I quietly captured this interesting resting place with my SEL55210 lens zoomed max to 210mm so I didn't need to get too close. See the enlarged vertical slice view for a details of the reptile's close eye lid. The next few landscapes that would have been some of the best of the morning ended up being tossed after I accidentally left my A6000 in manual focus mode that I normally use about 5% of the time while I thought I was focusing in spot auto focus that I used most of the time. 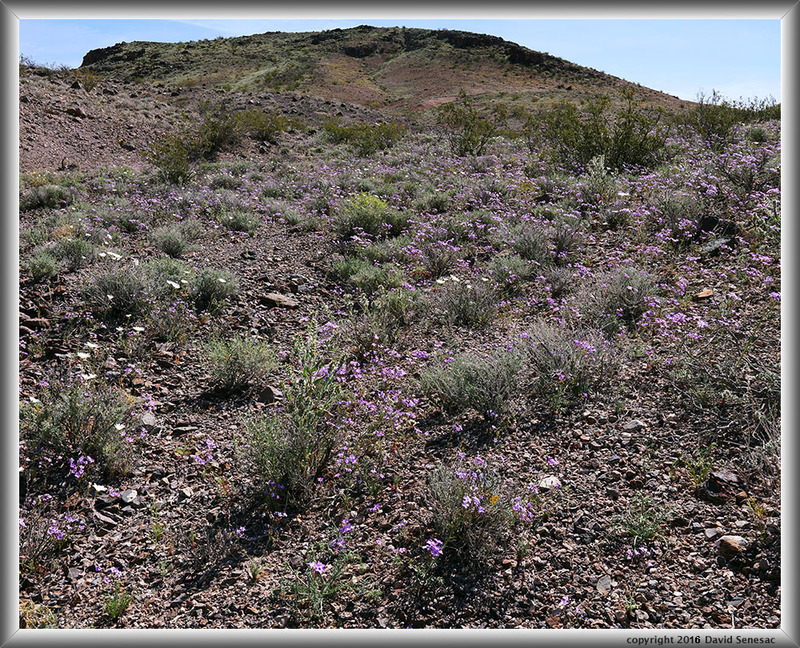 Well except for the above image of an upper basin bench with showy gilia, gilia cana triceps, and scattered white tackstem, calycoseris wrightii. 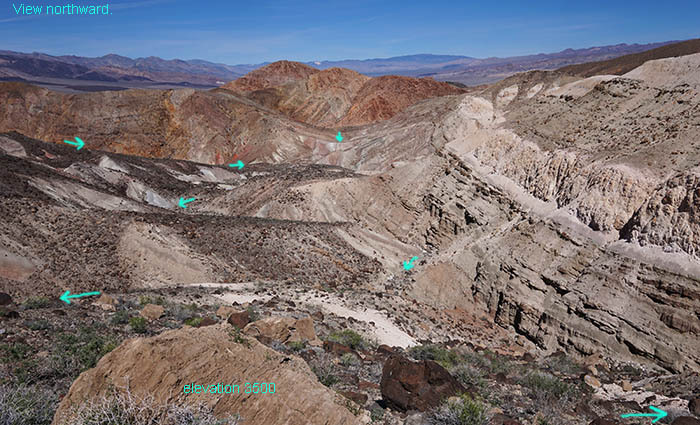 A visual reason I am calling this Gilia Canyon as there were several large areas adorned so. It was up on the ridge line in the background where greatest numbers of species in this canyon grew densely with bees in absolute heaven and where I lost some work. In the afternoon left Gilia Canyon for a nearby area of the main canyon. 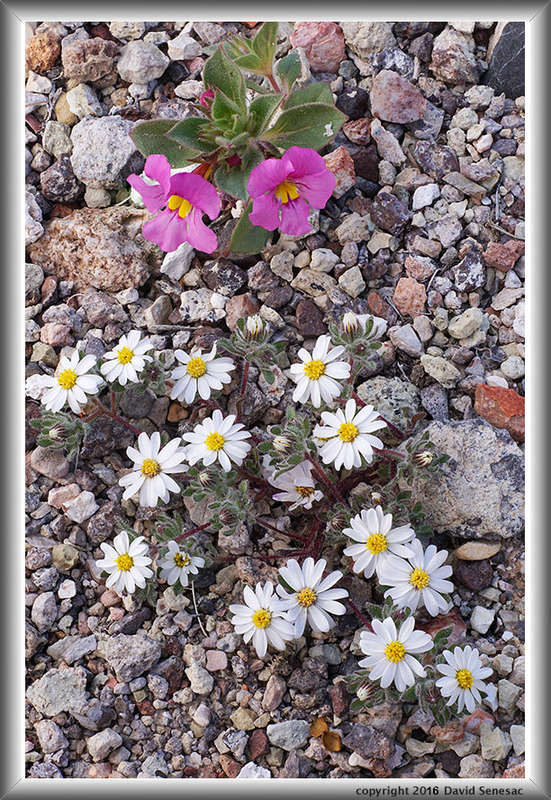 Along the way noticed the above exceptional subject situation of two Bigelow's monkeyflower, mimulus bigelovii , and rock daisies, monoptilon belloides, on stone gravels. It was an ideal subject for capturing the full frame in sharp focus. With the breeze blowing, the only wildflower subjects I might work were belly flowers so my eyes were continually scanning the ground as I walked up the broad wash. And it took quite some time waiting for lulls before I managed to fire off 7 shots to complete the focus stack set. All the while holding my circular reflector in my left hand as a wind break, the circular diffuser in my right plus the infrared shutter release and between each shot dropping the right hand contents to readjust the focus position. This new area up the main canyon had quite a few subjects I might have worked had it not been for the strong breeze shaking any foreground plants. But as is often the case in mountainous terrain that is down in canyon, winds tend to be erratic due to the topography and as such one may get lucky by waiting for lulls. Up on top of a ridge or out on an open plain that would not be the case and instead winds would never lull. Accordingly I waited out the above subject long enough to get in a few foregrounds in my image sets. Wind is of no concern on all the more distant focus points in each frame set thus just the near foreground captures. And one strategy I may use is when breezes do quiet, I may quickly take foreground shots for each panoramic position by quickly moving through pano positions trusting the graticule marks on the head without needing to actually look through my lens. 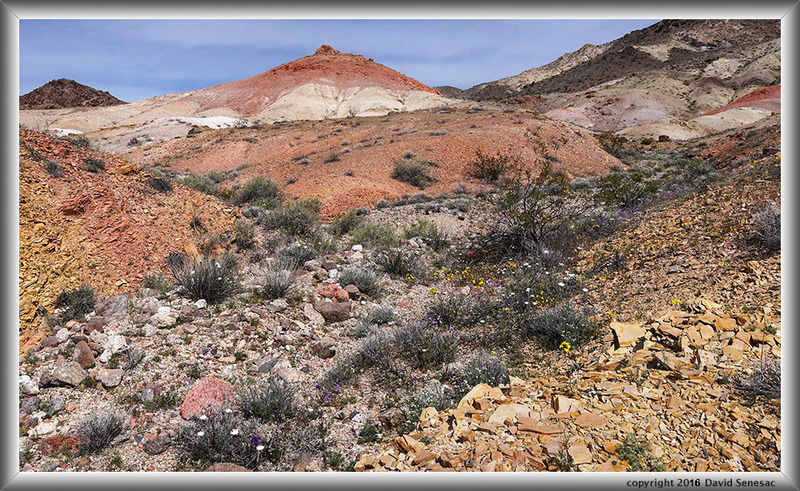 Now 3pm and confident I had captured at least one fine image in this other area with clay formations, and interested in shooting the Ubehebe Crater rim, in a fast walk rambled back down the canyon a few miles over awkward terrain and back to my vehicle. There my GPS track showed I had traveled through 11.6 miles of terrain this day, the most during the week. And yes I was weary though, I'd been hiking so much this spring that my body had become rather tough. Tossed gear into my Forester without much arrangement and sped off to the crater. I arrived about 6:15pm or about 45 minutes from sunset. The crater rim is a very exposed location and this day the wind at the end of the day was so strong that to take the above image of the crater, I positioned my car in the paved parking lot with diagonal parking slot lines perpendicular to the wind direction with my window on the lee side open while setting up the camera with tripod inside the car peering out...only with a Benbo haha. Well heck the lot this late in the day was half empty. This was with Sony SEL55210 telephoto lens at 152mm. Can you see the two people walking on the far rim? Guess you will need to find them in one of the 3 slices in the enlarged vertical slice view. As the sun set on Thursday I needed to make a decision on where to hike on Friday my last day in the park. Even though I had strong interest in returning to the Black Mountain destination I'd hiked Saturday, there was another colorful clay geology zone that I wanted to explore that would be much less effort. And I was getting rather weary so made the easier choice for the later. Traveling to the location was compounded by a few square mile barbed wire fenced zone where entry is prohibited. This is the Grapevine Springs area that is associated with the nearby Scotty's Castle ranch. The clay geology peaks were quite visible from the Ubehebe Crater paved road and are east of, directly behind the fenced area. And through my binoculars they looked rather interesting and that tipped my decision. I had carefully viewed the fence areas on Google Earth that appeared to be negotiable though would be awkwardly traversing across some modest gradient slopes in a few places. From a parked spot on the dirt Death Valley Road about sunrise Friday March 25 set out on a route that traversed across a wide plain, dropped into a wide wash, then climbed up to the northwest corner of the fenced area about mile along. The barbed wire fence was anchored by cement posts strengthened by rebar. Moving along the perimeter east required ups and downs on a slope with small ravines and much awkward footing. After about a half mile I reached the northeast end of the fence at the mouth of a wide canyon. Flash floods had thoroughly destroyed the fence across the wash that no doubt was fine with whatever animals might want to use those permanent springs for water. I turned south along the fence climbing up a crumbling slope and continued on quite a ways tediously traversing across side slopes and small ravines often with difficult footing on ball bearing rock debris. Besides at the noted wash, there were some other sections of fence crossing side slopes on the east side that had also fallen over. Since the ranch has not been active for decades, there are no longer cattle to corral within the fence. Thus the only purpose of the fence in this era is to designate a keep out boundary for the sake of protecting the springs and its wildlife. Eventually reached another canyon that I took due east up an easy wash about 3/4 mile, crossed a low divide, then went south a half mile where I reached my destination zone at 9am. Nicely the light breeze seemed to be reaching a null so with foreground plants nicely still was able to set up a multi row pano subject. I climbed up a ravine to get the above shot of a rusty red peak with the Saline Range in the distant background, the largest image of the trip at 15500 by 10000 pixels. Other than that subject there was not much else in the area of interest. Wildflowers were rather modest, much less than at Gilia Canyon. Returning the 3 miles back to my car across the unpleasant footing along the fence, it was obviously not a place I'd come back to in the future. My GPS track showed 7.8 miles. Over the week, the 5 long cross country hikes during the week had totaled up 51.2 miles of for this senior citizen. Since Ubehebe Crater was nearby and the breeze was not too bad, I drove back there and after lunch and a nap explored around the crater slopes working a few modest subjects. 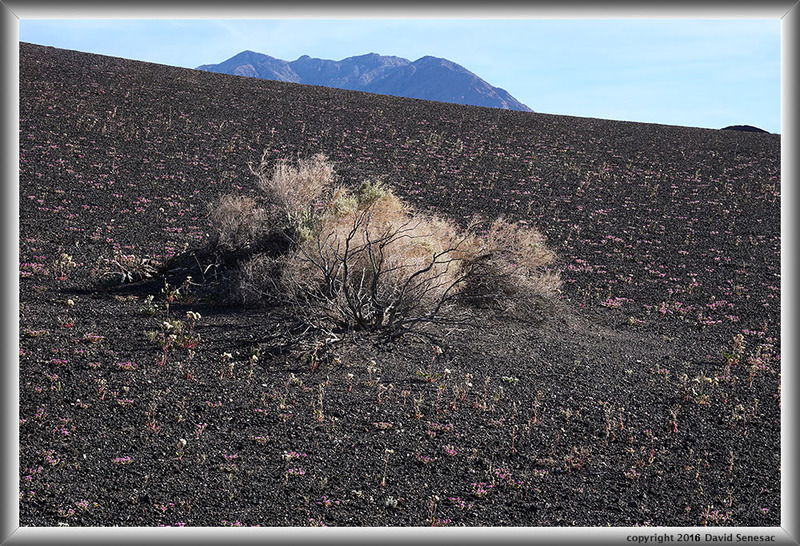 Of particular interest were the magenta hued belly flowers, purple mat, nama demissum, that provided a wonderful contrasting color to the smooth black volcanic cinder covered slopes. For the above image, I used a group of dead bushes, one a saltbush to anchor my frame with Tin Mountain in the background along with the small tip of Little Ubehebe Crater poking up frame right edge. A few white hued brown-eyed evening-primrose, clamissonia claviformis, are also in the foreground near the bush. In order to bring out greater flower saturation moved to this semi-backlit position with the sun above right. It was now almost 5pm and was time I needed to get on the road for a long drive that would last late into the evening. Thus sped south back to SR190 then west over Towne Pass and out of the park. By sunset had reached Trona then stopped in Ridgecrest for gas and fast food. A few hours later along I5 had reached the Roadside Rest at Avenal where I spent the rest of the noisy night with a full lot of others and big rigs. As dawn rose on Saturday March 26, I was driving north at 70+ mph on I5, a rather unpleasant interstate to drive because of the nauseating trains of other impatient drivers in cars going 80+ mph between most drivers content to move at 75 mph and groups of big trucks in the slow lane going 70 mph. My plan this day was to spend a few morning hours at Pacheco Pass State Park before the final 60 miles back home. The park was holding its annual wildflower day at the parking lot picnic area thus there would likely be more people at the park this day than any other time of spring. I reached the pass at 8am, got my gear set up for the last time, then drove into the parking lot that was indeed full of activity. There I met numbers of people including some I'd vaguely spoke with in past years. Talked quite some time with a couple CNPS leaders, the former state park manager, and current state park gals. The park was still very green with lots of wildflowers so visitors had much to enjoy. 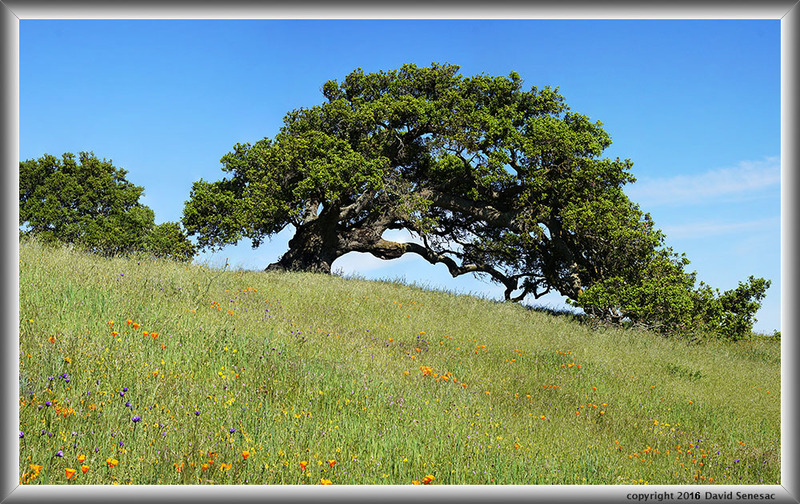 About 9:30am I began an easy hike up to the nearby ridge top I'd walked 9 days earlier where I worked a couple images including the below image of the park's most impressive coast live oak, quercus agrifolia, wind monarch and fighting to stay above now tall alien European grasses, this season's wildflowers, poppies, johnny-jump-ups, blue dicks, popcorn flower, white-tipped clover, filaree, and fiddleneck.